In 2006, Joey Ramp suffered 23 broken bones, an injury to her prefrontal cortex, and permanent nerve damage to the left side of her body after she and her horse took a fall. Ramp recalls plunging head first, and then the horse, which she had been training to play polo, rolling on top of her. She fractured her eye socket, cheekbone, and two vertebrae, and broke her jaw and collarbone. Two years and multiple surgeries later, Ramp’s body was restored to the extent that modern medicine would allow, but her injuries meant she could no longer continue her career as a horse trainer. She also faced a bigger problem: severe and lasting damage to her mental health. In combination with a history of childhood sexual abuse, the accident caused Ramp to develop symptoms that led to a diagnosis of a complex form of post-traumatic stress disorder (PTSD). Shortly after the accident, she began losing periods of time, with no memory of what had happened. She would dissociate from her environment, sometimes rendered unable to communicate, and at times completely losing touch with reality. Ramp, then a single mom in her 40s, became homebound, she says. And with no way to understand what was happening in her brain, she fell into a dark depression that almost ended tragically. It was the story of a service dog that had helped a military veteran recover from severe symptoms of PTSD, and it gave her hope. She decided she would look into getting a service dog to help her reintegrate into society and ultimately launch a research career studying PTSD. Now with her own golden retriever service dog Sampson by her side, the 54-year-old is earning her second bachelor’s degree while working in the neuroscience lab of Justin Rhodes at the Beckman Institute for Advanced Science and Technology at the University of Illinois at Urbana-Champaign (U of I). With skills in brain sectioning, immunoassays, and genotyping under her belt, rave reviews from faculty, and an undergraduate thesis in the works, Ramp next wants to earn a PhD. I was within minutes of taking my own life, and I made the deci­sion to instead try to rebuild one. But her research career faces a major hurdle: at the University of Illinois, Sampson is not permitted into laboratories that study live mammals. Ramp’s situation raises a difficult question: When should service animals be permitted—or not permitted—in scientific laboratories? As is the case with most difficult questions, the answer is: it depends. 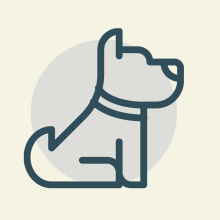 Institutions must consider the rights of people with service animals, but also the safety of everyone involved, the integrity of the experiments, and federal regulations for animal care and use. Wherever Ramp goes, Sampson goes too. In addition to the physical support he provides—helping her up stairs and picking up items off the floor, for example—Sampson is trained to alert Ramp to signs that she is becoming overwhelmed. If she starts rubbing her hands together or tapping her finger, Sampson will get her attention by nudging her leg or hands, and Ramp can assess the situation—and remove herself from it, if necessary. For these reasons, Ramp says, she can’t be without Sampson. She first realized that this arrangement would present some challenges in her quest to become a neuroscientist when she started at Parkland College, a two-year community college in Champaign, Illinois, in the fall of 2012. The faculty and administrators had no experience with service animals in the laboratory. 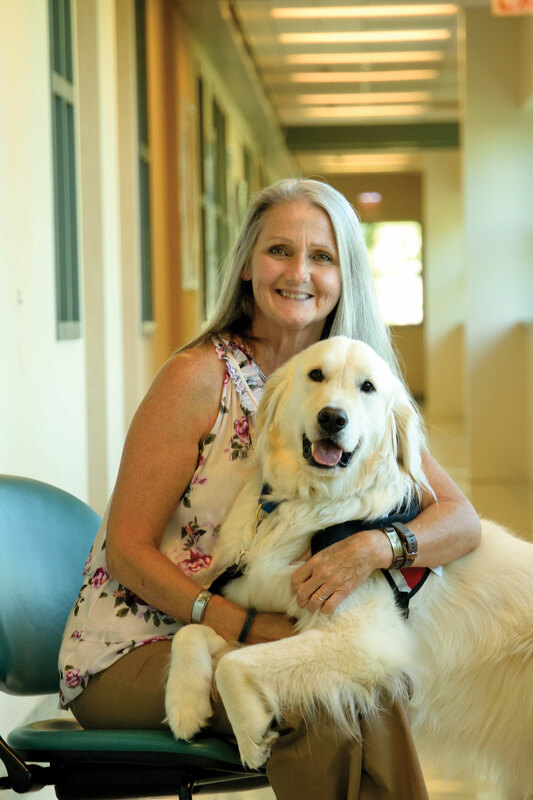 After several discussions, they arranged for Ramp and her service dog, then a Labrador retriever named Theo, to attend general chemistry lab courses. Some equipment was moved to ensure that Ramp wouldn’t have to crisscross the lab, and Theo had to wear goggles and shoes like the students did. “Everyone involved wanted to see if we could make it work,” says Parkland chemistry professor Andrew Holm. When she started at U of I in 2015, Ramp expected things to be easier. With the institution’s 70-year history of disability services, “I didn’t foresee a problem,” she says. But like the employees at Parkland, the U of I faculty and staff had never fielded such a request, and the university didn’t have clear guidelines on admitting service dogs into laboratories. 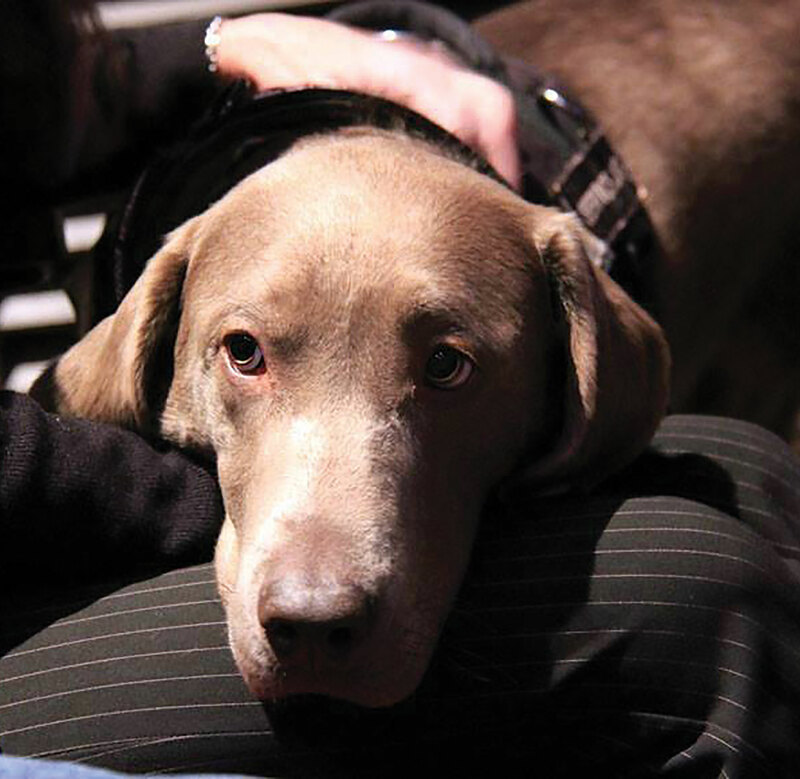 LAB PARTNER #1: Theo was the first service dog allowed in a chemistry teaching lab at the University of Illinois. Most of the time, accommodations can be made. In some cases, people who are able to be apart from their service animal might opt for that while in a lab, to ensure that their dog does not come into contact with any harmful agents or other dangers, says Jean Earle, CFO for a nonprofit organization that helps people with disabilities get education and work. Earle’s daughter, for example, is raising a service dog puppy while attending the University of Pennsylvania School of Veterinary Medicine, but chooses not to bring the dog into her labs, her mother says. 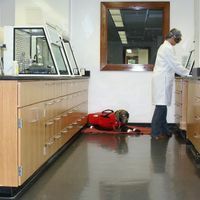 In other cases, the risks can be mitigated such that service dog teams can feel comfortable entering laboratory environments. In early 2016, after a year of discussions, Ramp’s dog Theo became the first service dog ever permitted in a chemistry lab at U of I. The following semester, Sampson accompanied Ramp for a molecular biology techniques course. But a psychology course that she wanted to take involved experiments with live rodents, and Janice Juraska, faculty supervisor for the course, was concerned that the rats would react to Sampson as if he were a predator. As a result, allowing Sampson into the laboratory space with live rodents would violate federal laws protecting research animals, says Robin Kaler, associate chancellor for public affairs at the university. For lab exercises involving rats, Juraska and her colleagues said Sampson could stay in a nearby storage room while Ramp attended the session. But if Sampson wasn’t going into the lab, Ramp wasn’t going in either. These laws don’t address the presence of service animals in the laboratory specifically, and the National Institutes of Health’s Office of Extramural Research notes that there are many possible exceptions to the recommendation that different species be housed separately. But when it comes to service dogs, “generally they should not be brought into an animal facility or laboratory to ensure biosecurity,” according to a statement from the office emailed to The Scientist. When enforcing these federal regulations on campus, there are two relevant exceptions to the laws’ protection, says L. Scott Lissner, the ADA and 504 compliance officer at Ohio State University. The first is if there is a direct threat to the health and safety of others. “The very commonsense rule of thumb . 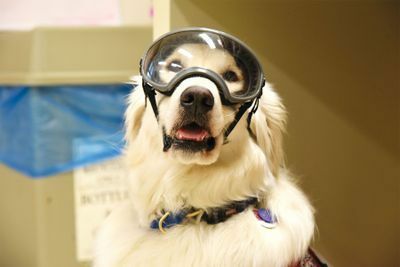 . . is if people have to suit up to go into the lab, then usually the dog can’t go in.” For some labs, such as those associated with chemistry and biology courses, protective gear for the dog may suffice. Labs that maintain sterile facilities or contain hazardous pathogens, on the other hand, are typically off limits. There’s no clear guidance on how to identify a service dog, more fundamen­tally, no less where can you take it. When it came to Ramp’s request to bring Sampson into the psych lab, Juraska had safety concerns. She thought that the dog risked exchanging pathogens with the rats, but more worrisome, his presence might affect the rats’ behavior. Becoming anxious or fearful, the rats might get agitated and bite a student, she says. Even a less extreme reaction could disrupt the experiments the students were running, and the rats could suffer in a way that went against animal welfare guidelines. “Wolves, and by extension dogs, are known predators, and there is research [showing] that their presence can cause anxiety and aggression in a prey species,” Juraska tells The Scientist in a written statement. LAB PARTNER #2: Sampson was the first service dog to enter a University of Illinois biology teaching lab, a molecular and physiology research lab, and a behavioral genetics and neuroscience research lab. Although there is some evidence that wild rats respond to dogs as predators, Ramp could not find compelling research on the effect of dogs on lab rats. “These are not wild rodents,” Rhodes says. 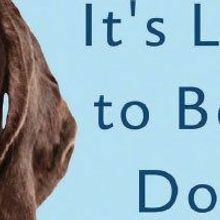 “They’re domesticated and have no experience with dogs.” But there doesn’t seem to be any research addressing this question. Recognizing this problem, Ramp applied for and received a $50,000 grant from an independent donor through the university’s Disability Resources and Educational Services (DRES) for a two-year study to explore this question. 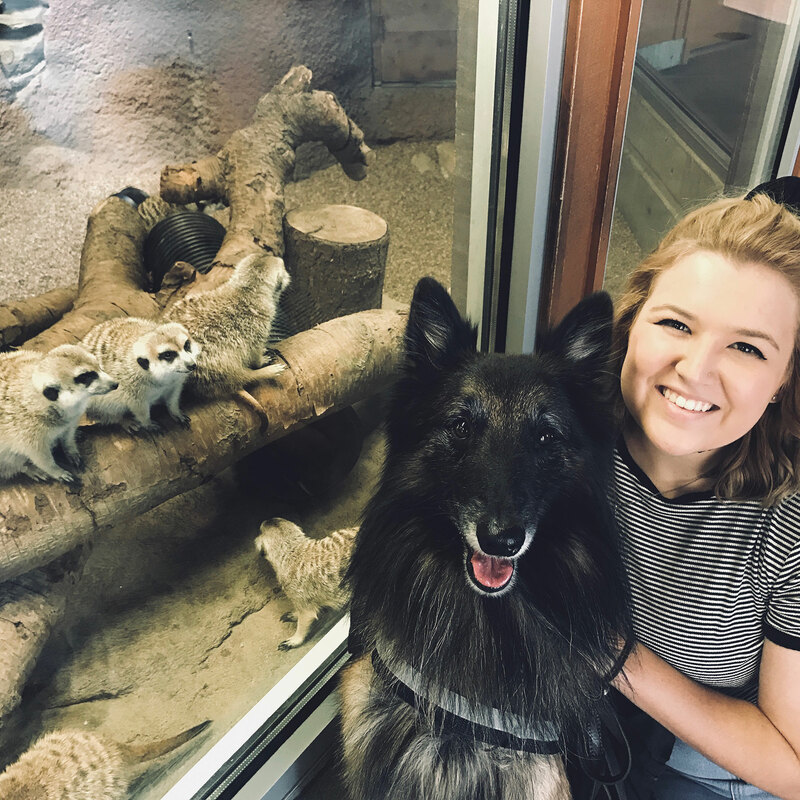 She joined Rhodes’s lab and enlisted his help in writing a protocol for the study to submit to the Institutional Animal Care and Use Committee (IACUC). 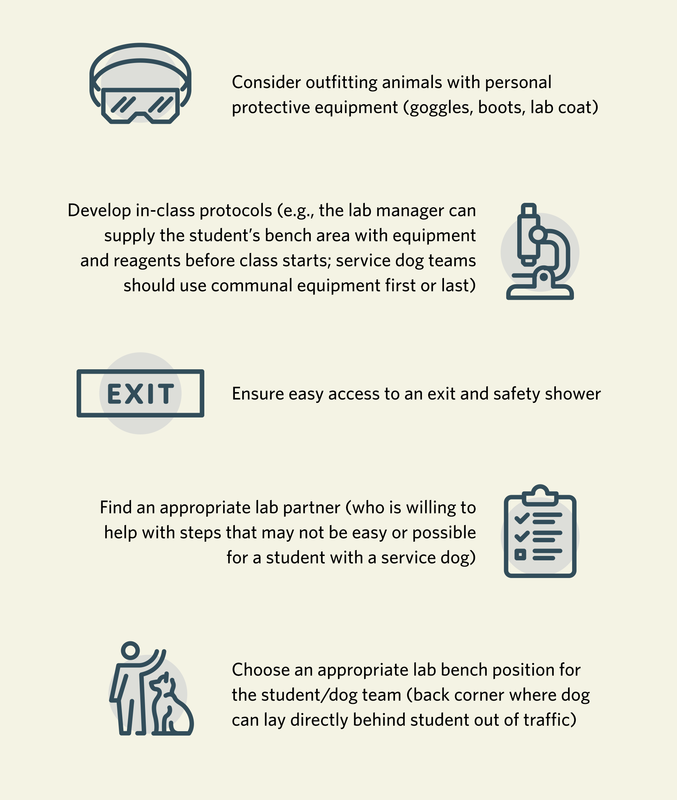 When a student with a service animal chooses to take a laboratory course, she should contact the institution’s disability services office to help arrange accommodations. In consultation with the faculty and staff in charge of the lab sessions, the case worker and student can devise a plan to ensure the safety of everyone involved. The study could provide data to guide appropriate policies regarding service animals in labs with live animals, Ramps says, and either give her confidence to pursue research that involves rodents or push her in a different direction. But to her and Rhodes’s surprise, the IACUC rejected the protocol—twice. The first rejection, from last December, simply cites “insufficient justification for the use of live vertebrate animals (mice).” Assuming the committee had misunderstood their proposal, Ramp and Rhodes had multiple meetings with Pat Malik, the director of DRES, and also spoke with IACUC head Josh Gulley. Rhodes then went before the entire committee to explain the scientific rationale and assure them that the experiment would be “pretty much innocuous” for the mice involved—IACUC’s main concern being for the welfare of the animals and the scientific justification for any harm they might endure. But again in March, the committee denied the request. ALWAYS THERE: Sampson accompanies Ramp to a ceremony for a Fred S. Bailey scholarship she was awarded. Ramp says she suspects that Sampson’s ban from the psych lab and the IACUC’s rejection of their proposal are related, and stem from prejudice against people with service dogs. In May, she filed a complaint with the US Department of Education’s Office for Civil Rights (OCR) alleging discrimination by the university, the IACUC committee, and Juraska. “We think that the entire response of the university reflects discrimination and in some respects may reflect retaliation for her efforts . . . to bring her dog in [to the lab],” says Ramp’s lawyer Matt Cohen, who specializes in disability rights. The university declined to participate in mediation, Cohen says, and the OCR has initiated an investigation on the IACUC’s rejection. (The agency is not investigating Sampson’s ban from the psychology lab course because the complaint was filed more than 180 days after the incident.) The university would not confirm or deny the complaint or investigation. Do Lab Rodents See Service Dogs As Predators? The National Research Council’s Guide for the Care and Use of Laboratory Animals states that research animals should be kept with their own species “to eliminate the potential for anxiety and physiologic and behavioral changes due to interspecies conflict.” This line cites a 2010 study that found housing mice and rats together in labs affected the behavior of both species, including causing chronic stress in the smaller rodents. Of concern is not only the lab animals’ welfare, but the integrity of the experiments involving them. If the presence of a service dog affects the behavior of the rodents, then research results could be compromised. In some cases, behavioral experimenters conduct trials from outside of the room, using video technology to record outcomes. When researchers are present, the lab animals should be acclimated to those conditions and the specific procedures involved in the study, Saskia Arndt, a professor of animal behavior at the Faculty of Veterinary Medicine at Utrecht University and a coauthor on the 2010 study cited in the NRC Guide, writes in an email to The Scientist. “It might be possible to train rodents to get used to the presence of a service dog,” she notes, but then those results would not be comparable to experiments conducted with no service dog present. 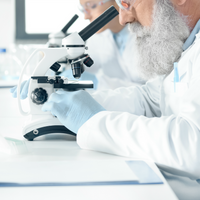 Regardless of the outcome of her legal case, Ramp is hoping that her story will motivate the development of better guidelines for making accommodations for people with service dogs in the sciences, whether in laboratory classes or research facilities with animals. Service animals are becoming more common—the number of active guide, hearing, and service dogs in North America, Australia, New Zealand, and Asia nearly doubled between 2009 and 2017, from 10,769 to 19,144, says Chris Diefenthaler, operations administrator at Assistance Dogs International. Thus, this is an issue that universities are likely to face more frequently. According to Kaler, U of I is already developing an update to its policy on animals on campus. Administrators have been working for a year on a version that will specifically mention labs. The new policy has been reviewed by the university’s legal team and has begun the process of review by the university. Students, faculty, and other staff will have the opportunity to comment before it is added to the Campus Administrative Manual, she says. Several institutions have already published new policies on having animals on campus in the last several years, and many more are on the way, says Novakofski. But given the rare and diverse nature of the requests to bring service dogs into the laboratory, it’s “hard to come up with hard and fast rules that are simple enough for everyone to follow and still are acceptable legally,” Earle reiterates. More important than concrete policies on service dogs in the lab, she adds, are guidelines on what to consider when making the decision and protocols for making accommodations when appropriate. In March, Redden and Christopher Sweet at Cornell University’s Institute on Employment and Disability published a chapter in an ACS Symposium Series book on admitting service dogs to chemistry labs. And Ramp has put together a template based on her experiences with Theo and Sampson. (See infographic on page 47.) At Parkland College, her efforts are already making a difference, says Parkland’s Holm. The campus has since made accommodations for service animals to accompany their handlers to the gym and to a cadaver lab, and there is currently a student with a service dog taking the same intro chemistry lab that Ramp took with Theo. “Her pioneering—it’s paying off,” Holm says. A career in research may not be in the cards for Ramp, though. While she awaits the OCR’s decision, she is considering her future. If she is unable to get IACUC approval for her study, she will lose her funding, and she will not have data to know whether she can conduct the mouse experiments she’d envisioned for her graduate research. One back-up plan on the table is attending law school. 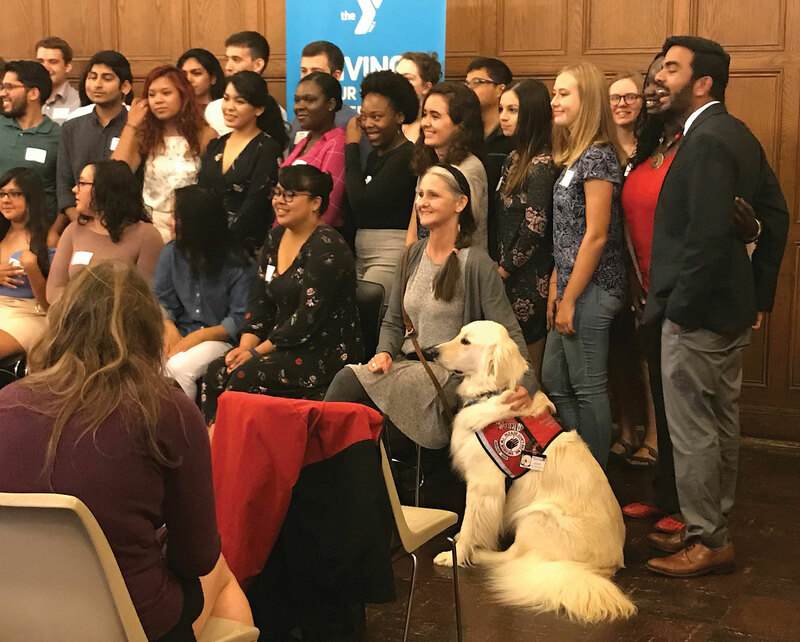 If science doesn’t work out, Ramp hopes that a law degree could allow her to help other individuals with service dogs navigate the legal system, and to change policies that discourage these people from pursuing an education in STEM. Since she was four years old, Sydney Sheets has wanted to be a veterinarian. She joined 4H when she was nine and began training and showing dogs. Beginning in fifth grade, she volunteered at a local vet clinic, even scrubbing in for surgeries. And when she started college in 2015, she chose Texas A&M University because of its renowned veterinary medicine program. But at age 16, Sheets learned she had type 1 diabetes. Rocked by the diagnosis, she focused on something a nurse at the hospital had told her—she could get a service dog. She found her puppy, a Belgian tervuren she named HALO, through a certified breeder, and with the help of her dad and 4H leaders, trained him to alert her to dangerous swings in her blood sugar levels. By her sophomore year of college, Sheets didn’t go anywhere without him. Like Joey Ramp, Sheets is running into problems pursuing her dream job and the education that would make it a reality with a service dog by her side. Both at Texas A&M and at Tacoma Community College outside of Seattle, where she took classes during the summer, HALO attended biology and chemistry labs with Sheets. He even followed along to a course on reproduction in farm animals, which included palpating a cow to check to see if it was pregnant. 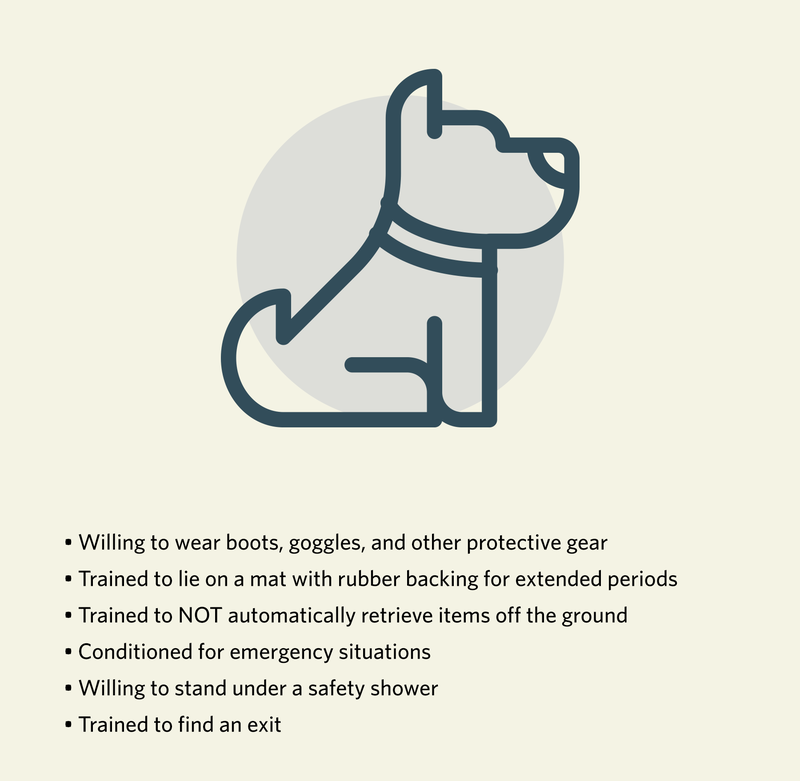 The professors, TAs, and administrators at the school helped make the necessary accommodations to allow HALO to continue monitoring Sheets while she participated in such activities. But when she enrolled in an animal science research class that involved field trips to the Texas A&M’s horse, sheep, pig, and cattle facilities, the professor, Courtney Daigle, told Sheets that HALO was not allowed. Sheets filed a complaint with the school, which found that the professor had not been in compliance with the ADA, Sheets says. Still, she withdrew from the class, later switched her major to sociology, and is now rethinking her career direction. “[The incident] just kind of sucked a lot of the joy out of what I was doing,” says Sheets, who is set to graduate in December 2019 and hopes to pursue a PhD in psychology. The university could not confirm or deny the existence of the complaint or the experiences of an individual student; Daigle did not respond to requests for comment before deadline. A version of this story ran on the-scientist.com on September 18, 2018.